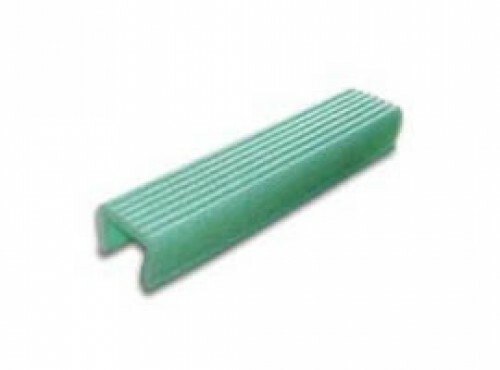 The joist cap is extruded from a low density high attenuation foam based on a combination of polyolefin and specialist additives to produce foam which exhibits superior acoustic characteristics. The Joist Cap profile has been scientifically designed so that one size fits tightly over a rough cut or planed standard nominal 50mm joist resulting in a stable floating floor surface, completely isolated from the rest of the structure. The castellated top contact surface optimises the acoustic attenuation properties of the foam. By moving the mass layer above the resilient layer the floating element forms a stiffer structure spreading the load and lessening the diaphragm affect, whilst the resilient layer acts to dampen and absorb the sound energy. Where you are looking to create a floating floor working directly off joists then the joist cap is very cost effective means of doing so. The joist caps fit snugly onto the existing joists up to a width of 50mm. A floating tongue and groove floor(typically tongue and groove chipboard) can then be floated on top of it. We would recommend the use of angled flanking band in this set up to effectively seal the sides of the floating floor. Delta L w24dB with a deep batten can be expected. Delta L w20dB can be expected. The jaws of the caps are slightly tapered in to ensure a tight friction fit. Simply open the jaws and sit the cap over the joist ensuring the base is located tightly with the joist surface. In all applications, our perimeter isolation strip must be used so the floating floor is fully isolated for the structural floor and walls.